The TED talks have returned. The high-powered and free-ranging global conference on Technology, Entertainment and Design with its 18-minute orations of irrepressible fervor and unbridled imagination is celebrating its 27th year, the last year before it relocates from Long Beach to Vancouver. Most of us lack the requisite $7,500 to gain admittance into TED or even the $3,750 for the TEDActive satellite events in Palm Springs, but we were lucky enough to catch yesterday’s TED2013 LiveStream feed at the home of UPOD founder and occasional Los Angeles contributor David Hochman. Fusion reactor inventor Taylor Wilson, who is only 17 years old, pancreatic cancer investigator Jack Andraka, 16, and the bluegrass-playing prodigies known as the Sleepy Man Banjo Boys were among this year’s wunderkinder. Musician Amanda Palmer of the Dresden Dolls described the similarity between crowd sourcing and crowd surfing in her look at the importance of trust in an artist’s relationship with her art and her audience. Vocalist and beatboxer Beardyman and artist Phil Hansen demonstrated how their bodies were part of their work and explored the creativity forged out of constraint. Septuagenarian Whole Earth Catalog creator turned Long Now Foundation co-founder and TED stalwart Stewart Brand detailed the role of biotechnology in resurrecting extinct species. 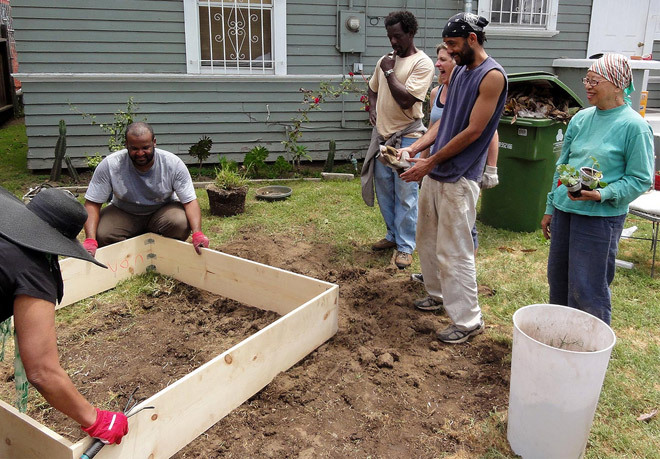 For Finley, these gardens were places for restoring the health and the wealth not only of individuals but a community as a whole, or as he put it: “Growing your food is like printing your own money.” More than merely fascinating, Finley’s talk was galvanizing. He concluded by informing the assembled TED braintrust he didn’t want “to sit around in cushy chairs and have meetings.” “If you want to meet with me,” said Finley, “come to the garden with your shovel.” It was a sincere yet unflinching invitation, a powerful recognition that in the cultivation of our own gardens there is still a lot more road to hoe.